An ankle sprain is an injury that causes a stretch or tear of one or more ligaments in the ankle joint. Ligaments are strong bands of tissue that connect bones at the joint. Sprains may be classified as mild, moderate, or severe. There are many ligaments in the ankle. The most common type of sprain involves the ligaments on the outside part of the ankle (lateral ankle sprain). 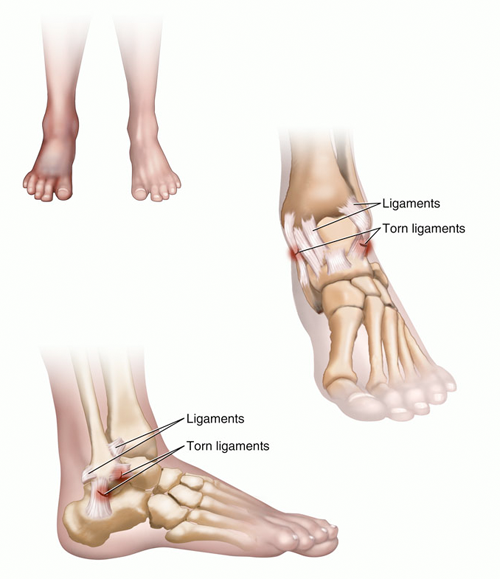 Ligaments on the inside of the ankle may also be injured (medial ankle sprain) as well as ligaments that are high and in the middle of the ankle (high ankle sprains). A sprain is caused by twisting your ankle. Your foot usually turns in or under but may turn to the outside. To diagnose a sprained ankle, the healthcare provider will ask about your symptoms and examine your ankle carefully. X-rays may be taken of your ankle. Raise the ankle with a pillow when you sit or lie down. Use an elastic bandage, lace-up brace or ankle stirrup (an Aircast or Gel cast) on the ankle as directed by your provider. Use crutches until you can walk without pain. Follow your provider's instructions for doing exercises to help you recover. Rarely, severe ankle sprains with complete tearing of the ligaments need surgery. After surgery your ankle will be in a cast for 4 to 8 weeks. The length of recovery depends on many factors such as your age, health, and if you have had a previous ankle injury. Recovery time also depends on the severity of the sprain. A mild ankle sprain may recover within a few weeks, whereas a severe ankle sprain may take 6 weeks or longer to recover. Recovery also depends on which ligaments were torn. A lateral sprain (outside ligaments) takes less time to recover than a medial sprain (inside ligaments) or a high ankle sprain (high, middle ligaments). Everyone recovers from an injury at a different rate. Return to your activities depends on how soon your ankle recovers, not by how many days or weeks it has been since your injury has occurred. In general, the longer you have symptoms before you start treatment, the longer it will take to get better. The goal of rehabilitation is to return to your normal activities as soon as is safely possible. If you return too soon you may worsen your injury. You have full range of motion in the injured ankle compared to the uninjured ankle. You have full strength of the injured ankle compared to the uninjured ankle. Wear proper, well-fitting shoes when you exercise. Stretch gently and adequately before and after athletic or recreational activities. Avoid sharp turns and quick changes in direction and movement. Consider taping the ankle or wearing a brace for strenuous sports, especially if you have a previous injury.